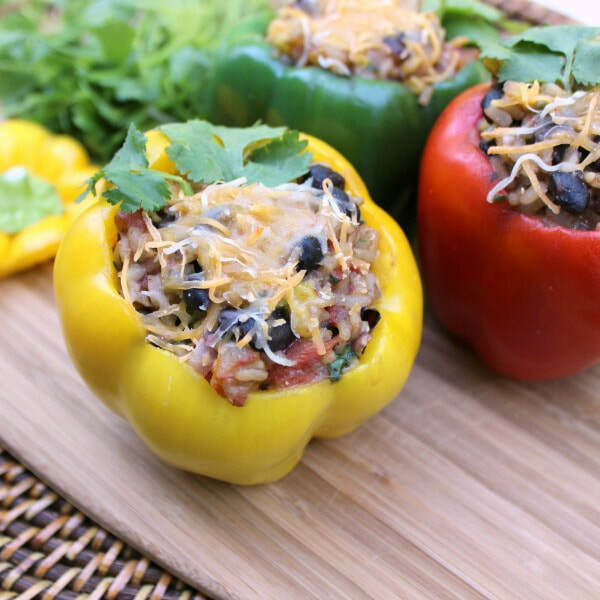 Filling colorful bell peppers with fresh produce from your fridge or what’s in your pantry creates a great budget-friendly meal. Want some other ideas for similar meals? Try this Stuffed Summer Squash recipe or these Southwest Baked Potatoes. Wash peppers and cut a wide circle around the stems. Grab stem and twist to remove the inside and seeds. Shake the pepper over the sink to get rid of the leftover seeds. Optional: sauté chopped onion in a pan with 1 Tbsp vegetable oil until translucent. Combine onion, cooked rice, black beans, corn, and tomatoes in a bowl. Add salt and pepper and optional spices and herbs. Add ½ of the shredded cheese. Mix. Fill the peppers with the mixture and top each pepper with the leftover shredded cheese. Bake for 20 minutes, or until cheese is melted and peppers are slightly softened. ​Top with optional toppings, if desired. * Nutrition information includes Mexican blend shredded cheese in analysis.